A heavy weight in reclaimed teak. It weighs in at a massive 110kg’s and is nearly one and a half metres tall and wide - so think carefully about where to put – you may not want to move it twice! 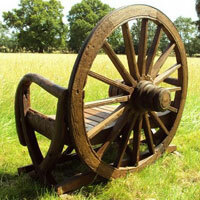 The reclaimed wagon wheel that has been used for the back support can be seen in all its glory in the back view pictured. This photo also demonstrates the way the whole thing is angled back slightly for added comfort. The mixture of worked reclaimed teak and teak reclaimed from teak in its natural state lends the bench a paradoxical feel unique to this piece. The smoothed teak feature board in the middle of the front cross support is just begging to be engraved or have a plaque added to further personalise the bench. Two people can sit comfortably on this reclaimed teak bench and the centre of the wheel bearing is used to good effect as a divider and armrest in the middle of the two shaped seating sections. 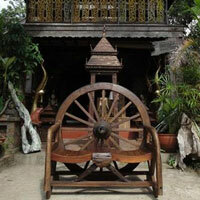 The curved, natural teak arms add a different dimension along with the other supporting sections in the same style. When you consider the work and craftsmanship that has gone to make this impressive bench it’s a bargain at just under £400 – especially when you consider that you’re helping to reduce deforestation in Indonesia as well. 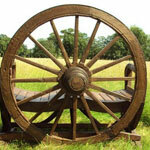 The teak wagon wheel bench is just wot we was looking for a real feature in our garden. This is really well made very heavy and excellent value highly recommend . Good service too. 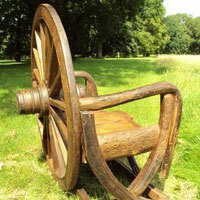 Great looking chunky antique type of rustic furniture.Very we'll built and would look good indoors or out. The bench is beautifully designed, sturdy and fits well in our home Delighted with it. Many thanks.